The long, narrow form of these buildings, which provide 68 ensuite student rooms, is dictated by the available site, 175 m. long and just 6 m. deep. The new blocks abut the backs of older college buildings, and define the southern boundary of the Radcliffe Observatory Quarter, fronting onto a new street space also designed by McLaughlin. The ends of the blocks are marked by five storey, glazed stair towers, with the windows framed by a deep timber lattice, and the gap between the blocks forms a new entrance to the college site. 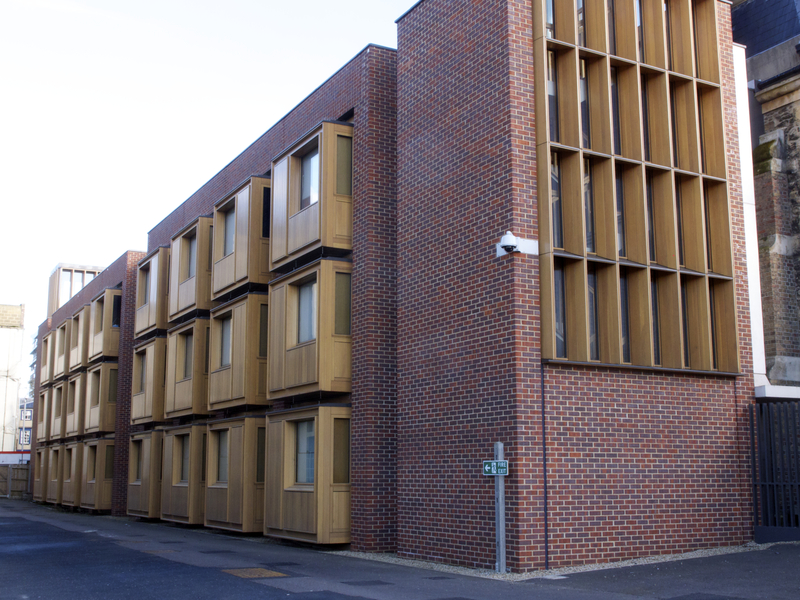 Two materials dominate the form and colour of the buildings: a dark red brick consciously references Keble College, while a light coloured oak is used for the lattice frames and for distinctive bay windows, reflecting those of Philip Dowson’s Wolfson Building on Walton Street (1968). References: Tom Holbrook, “Town and Gown: a student residence . . draws on picturesque planning traditions to make a new street for the city”, Architecture Today, no. 226, March 2012.